I don't know if it does have something to do with the updates as I have checked my 3 stores (totalling around 500 listing) and they all migrated and I've had no issues with the listing name changing or anything else... well, I've still got the corrupt listing from the xls migration, that doesn't show on my manage listings page but everything else is fine. but I've not done anything with the listings on the website nor via the viewer. I'm laying bets there's issues around writing to the db from two different sources, or the viewer code is defective and that's why we're seeing failures or it could just be that it's generally broken (that's a technical term yanno). All Direct Delivery listings have now been migrated to Viewer-Managed Marketplace(VMM), and the VMM-enabled viewer is now the default Release download. I don't think that's the case, Darrius. I don't think CTL is doing anything in the background. I don't even think they are working on the description JIRA at the moment if you look at the comments on the workflow page. When you look at the JIRA - the change in descriptions can be either a simple change to the correct object name, or, as in my case, a completely random and erroneous name being assigned to the listing. For instance, cream colored dress now with the description purple dress. What is happening on my listings is that the listing name is being reverted to the first object name. for example, a houses original name, before several version updates, was Montecito House boxed.mThat was never the listing name, but thats what was shown before I fixed it. And also shown when it reverted after that fix. I fixed it again, hope it sticks. It won't. Check them after sales. Five (5) more descriptions changed over night. Yesterday they were correct, today they are the name of the object, not the description that I had given them. This is the sort of report that makes me think they are running background database processes .. probably overnight .. to fix "issues" they identified during the day. What other reason could there be for "touching" those item records? Did you make sales on the objects that changed overnight? Did you "touch" them with your Viewer (LL's or TPV's)? Nope, didn't touch them (hardly even logged in yesterday at all), didn't sell any overnight. They were not identified as problems yesterday, because they were correct. There is no reason for those records to have been touched, none. And considering that they changed "overnight", most likely while no one was in the LL offices .. and you have perfect evidence for a background process left running that simply did more than expected/intended. I think this is really one of the biggest issues the Dev Team has: They "assume" that their processes and tasks will run perfectly while they are gone, and since it's "Only Merchants" and their data .. Mehh! Who cares?!? These messages were seen during the Magic Box days, but rarely if ever during Direct Delivery. Since the MP is now pulling from our inventories directly, does this mean that there are going to be delays and failures of delivery again? Especially when there are inventory asset server issues? I wasn't performing any action at the time - no purchases, nothing - I was literally just rezzing. What does that mean?? It means somebody fuuuuuu ... ummm .. fumbled something. It also means there are still areas within the code where debug and diagnostic messages are displayed. And it means there are race and timing conditions they are still "tweaking". One of the most problemmatic areas over all my time in SL has been the ability of a remote program (such as the Viewer for example) to properly access and load a user's inventory. But this has also been an operation done at the end of a long wire (the internet). The theory behind VMM was that all transactions would take place "in-house", between SQL servers, and thus not be susceptible to failed transactions or timing delay issues. The intially overdue roll out of VMM was then rushed towards the end and an unreleased viewer thrust upon the great unwashed mass (aka 'Just Merchants'). Please don't pose difficult questions at this time, ask about fun stuff like RAINBOWS or UNICORNS instead. my tuppence is that none of my sales from the accounts that run separate stores have reverted from the listing name to the item name, nor have any of the items that have not sold and I've still not done anything via the web or the viewer. this issue of reverting to the item name is interesting as that's the default name irrc for a listing between the loading of the item and the creation of the listing. I'm wondering if something is wrong and somehow the db is losing the listing name so it is replacing it (as it would) with the item name. Their geeks are in theory clever, I'm sure they'll work it out.. or will just ignore it because it's too hard and hope we forget that it was a defect, rather than an undocumented design feature that we will grow to love. Since the MP is now pulling from our inventories directly, does this mean that there are going to be delays and failures of delivery again? Especially when there are inventory asset server issues? It happened two days ago and will happen again every time the asset servers break down. In the Marketplace Merchant Home page -> Manage Listings-> Viewer-Managed Marketplace section, the listing dates for products are completely messed up/incorrect. It happened in the past 48 hours or so. The dates no longer show the correct listing dates, but a variety of dates more recently (for my store it ranges from July 30 to August 23). What was changed? And PLEASE correct it. Would have happened before. 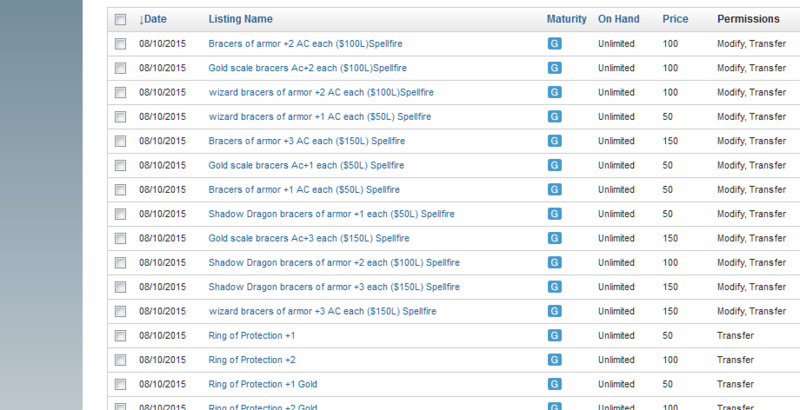 Marketplace has used inventory servers ever since Direct Delivery. With Magic Boxes, they could fail whenever the region the box was on had issues. I added a comment to it. I hope other Merchants will check their stores/Manage Listings section to see if they are affected, and if they are, to comment on the JIRA as well. I would love to comment on that Jira, but it wont let me. All of my items seem to have the date they migrated from the DD system to the VMM, August 10th. Drake, Commerce Team (Brooke) acknowledged the bug and they are working on a fix for it - they hope to have it this week - She left a comment on the JIRA about it. That's probably why you can't comment any further. "Unprocessable Entity: Worn items, calling cards and folder links cannot be part of a Marketplace listing." None of these my items features any of these forbidden entities. I've tried putting a replacement folder in there. I've tried unpacking the item from a box from my in world store so it's completely fresh but I still get the same message. Apologies if this has been asked before, but I can't find any reference to it.